Until now, I never owned an Artis brush and frankly, I find their brush style to be a bit gimmicky. I have some knock-off versions of their classic brushes and while I do love the larger ones for foundation, I can't get on board with the other ones. Even though I really enjoyed the larger style brushes with the handles, I was hesitant to pick one up after many people claimed that the handles were flimsy and broke over time. Luckily, this brush has no handle but it still has the same density and hairs as their classic brushes. 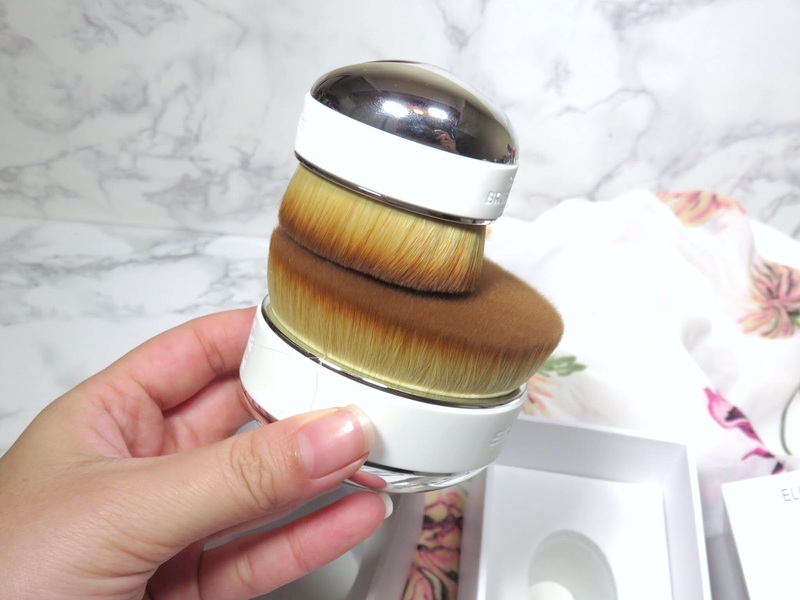 The Artis Mini Palm Brush retails for $52.00 USD and is available at Sephora and other retailers. Artis brushes are designed because of the lack of a brush style that is ergonomically designed for an individual to use on themselves. All the brushes on the market were designed for an artist to easily apply makeup to a client but no one was designing brushes that could easily flawlessly apply every step of the makeup process on themselves. These brushes are also considered luxury brushes, designed with proprietary brush fibers, exclusive to the brand. Additionally, what is very unique about all of the Artis brushes is they are all very dense designed to mimic fingertips for a smooth and flawless application. The design of this brush is ergonomic genius! Upon initial inspection, you will think the design is a bit awkward and cumbersome to hold but this brush has a very genius design that makes it extremely easy to hold and use. While you can grip the brush by cupping your hand around it and placing it in your palm, the best way to hold this brush is almost as you would hold your computer mouse. With your finger placed in the small divot in the back of the brush and you thumb wrapped around one side and the rest of your fingers resting around the other side of the oval shape. Yes, that's right! They actually designed a little spot for your finger! 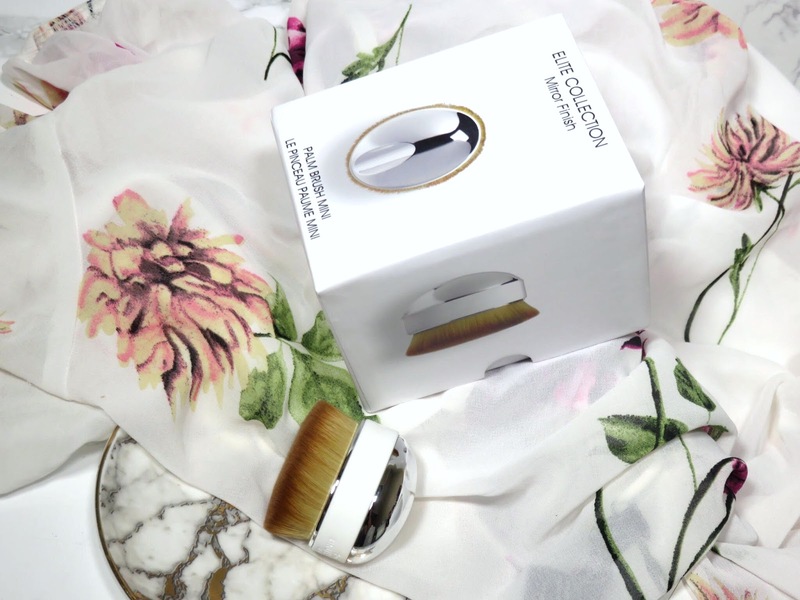 This really helps you get a good, yet comfortable grip on this brush and I find it makes it so easy to blend your makeup, whether you want a light applicator or a heavier application. See the groove made for your finger? Place your finger on top, like you're holding a computer mouse. I actually accidentally purchased both sizes of this brush because I had them both in my Sephora wishlist but in different locations. I didn't realize I had ordered the large one until after I put in my order in, so I followed up with an order of the mini, which is the one I really wanted. 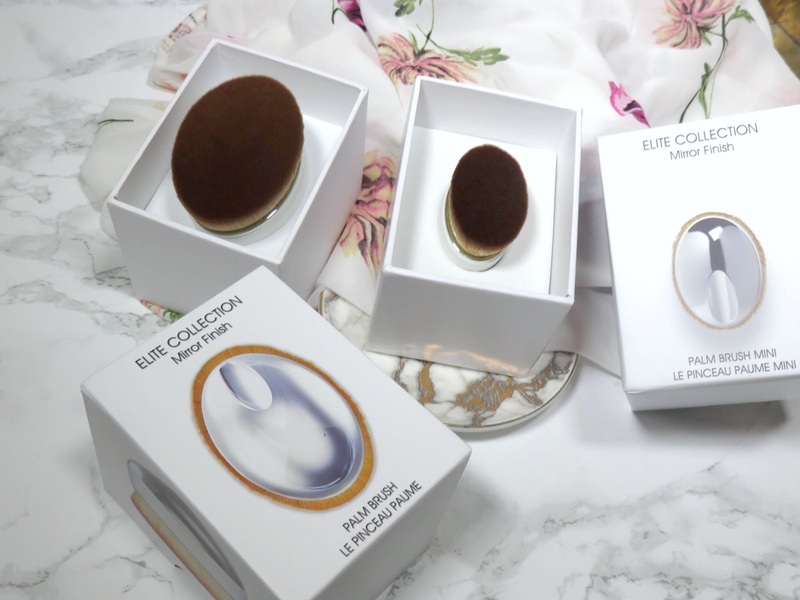 I did return the large one because it was much too big to use on my face and looks like it is really meant for the body. The original (large) brush is about the size of my palm, which makes it incredibly difficult to apply anything whereas, the mini is about 1/3rd of the size of the original palm brush and it is more narrow in shape. 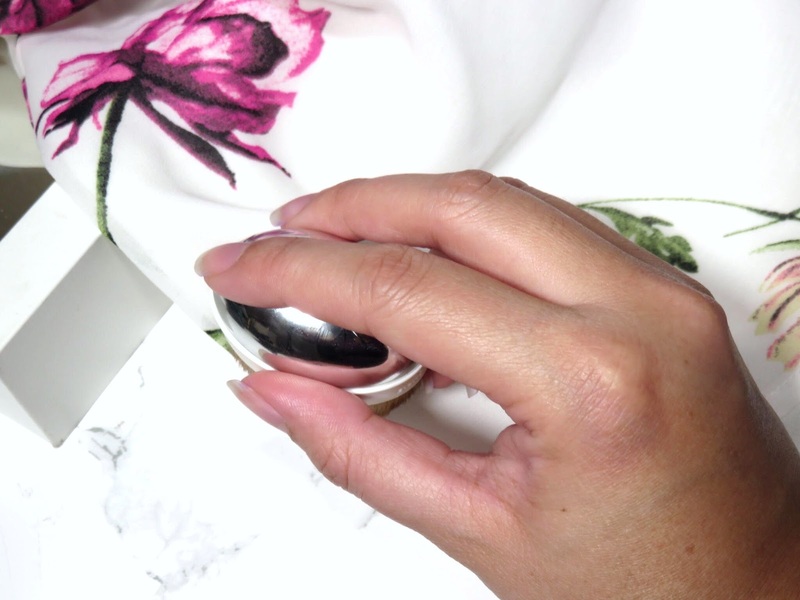 The Mini Palm makes more sense for applying face makeup and it is also go great for travel. The smaller size of the brush makes it much easier to manipulate and use than the large size. This brush is designed to "do it all". 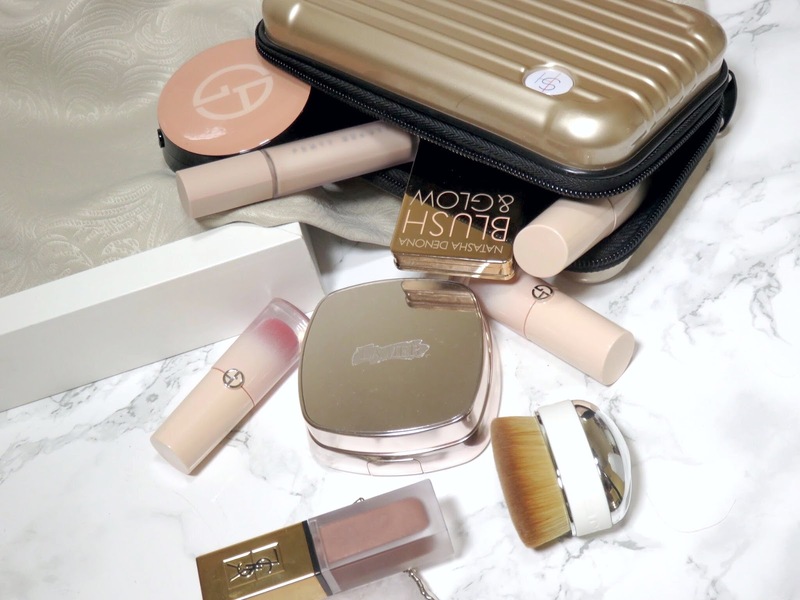 It is meant to apply every step of the base from foundation to powder and bronzer. 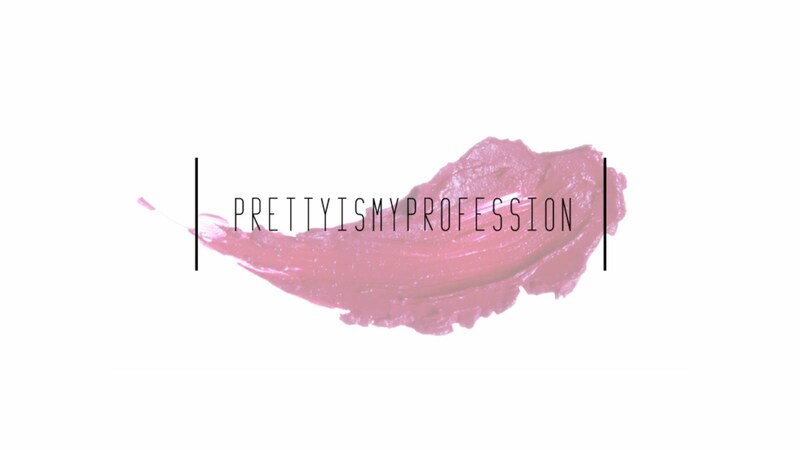 Personally, I find it much too dense to be used with certain products and formulas. Also, while you can use this product for bronzer, blush, concealer and other base applications, the size and shape is a bit too awkward for this. Bronzer application, particularly something that comes in stick form works well with this brush because it can buff the product into and spread the product onto a large area. Anything in a stick form, this product will work very wel with. For more precision application and blending, like concealer is not as easy with the shape and size of this brush. This product works best for foundation application, which is what I will focus my review on. I initially bought this brush to use with my cushions and it is PERFECT for this use!! 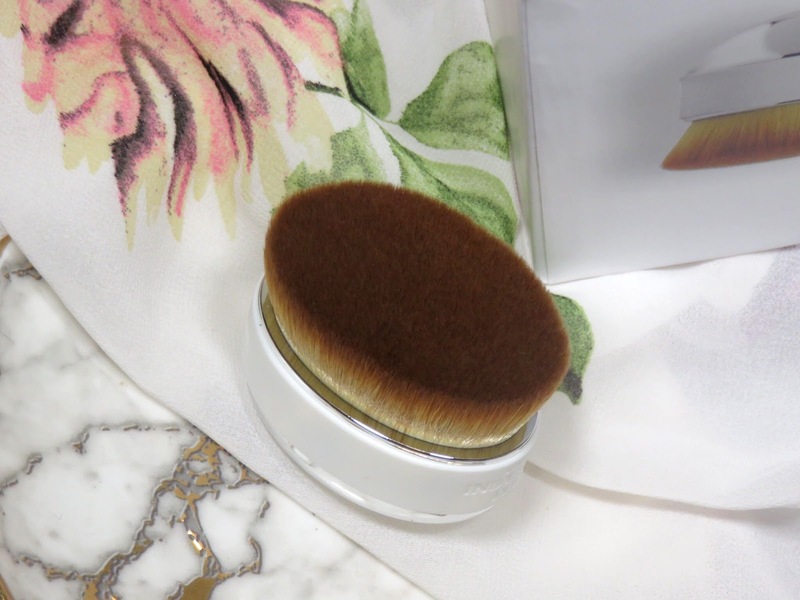 I have never been a big fan of the sponge applicator included with cushions and I often use a very dense brush and stipple my foundation on. This method gives me the most coverage and the most flawless blend. The density of this brush with the distribution of the hairs creates a surface that mimics a cushion sponge by creating a very dense surface but because there are individual hairs, you can really stipple and press the product into the skin to create an airbrushed finish. The shape and size of the mini palm also perfectly fits into most standard sized cushions and picks up product just like a cushion sponge would, just on the surface of the bristles. 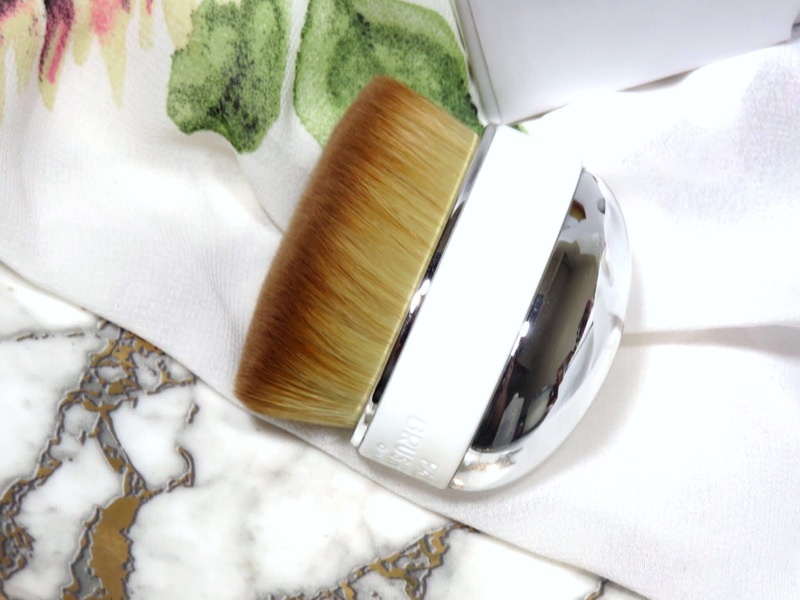 If you love your cushion foundations, this brush is a MUST-HAVE companion! Because the brush is so dense, it moves the product around but it doesn't push it into the skin, making it much more difficult to get an even and flawless application Which is why it is often best t apply liquid products with a duo-fiber stippling brush because of the way the bristles are sparsely distributed, providing an airbrushed finish. 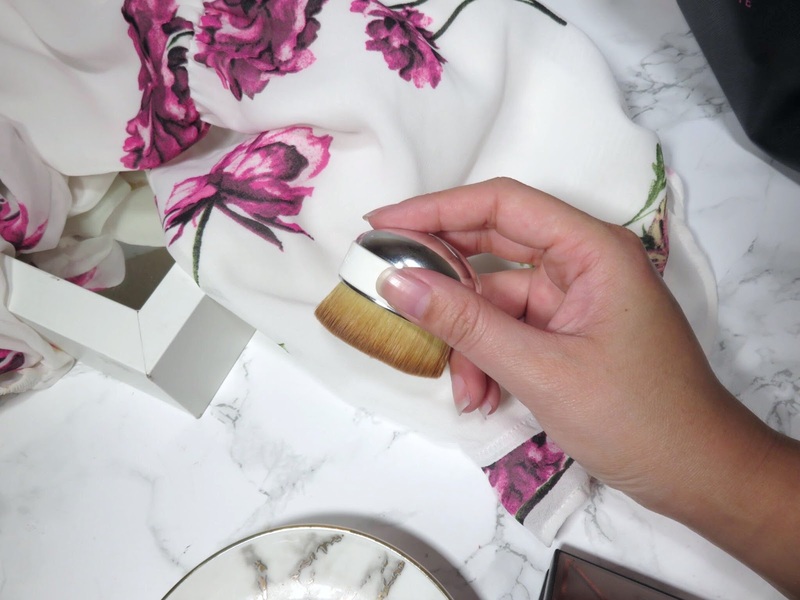 If you want to apply a liquid foundation or liquid product with this brush, I recommend applying the product in a thin even layer all over the face first, then use the brush to blend the product in. If you dot the product all over the face, it will be difficult to evenly distribute the product and blend it into the skin. 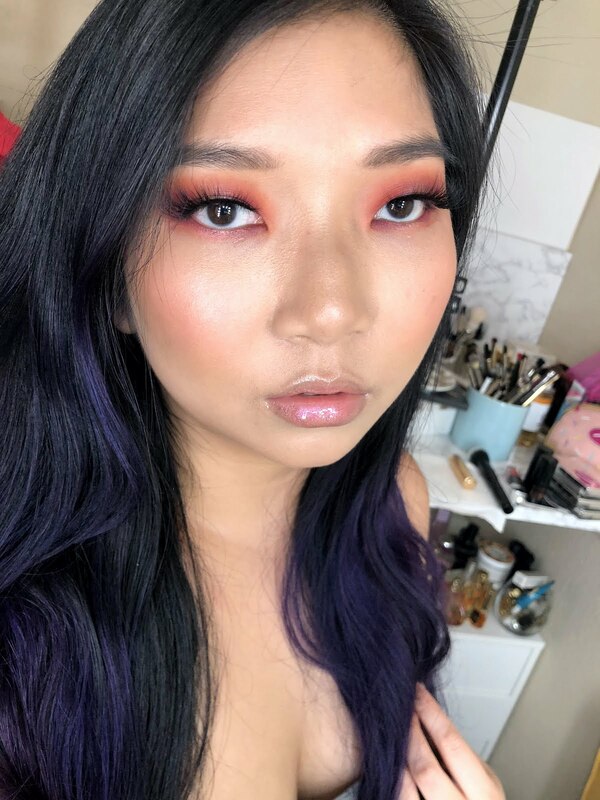 The other option is taking some kind of makeup artist palette and spreading your liquid products across the palette in a very thin layer, then dipping your brush into the product and applying it to the skin. This method allows for you to evenly distribute and pick up the liquid product on the very dense surface of the brush, making the application easy and even. 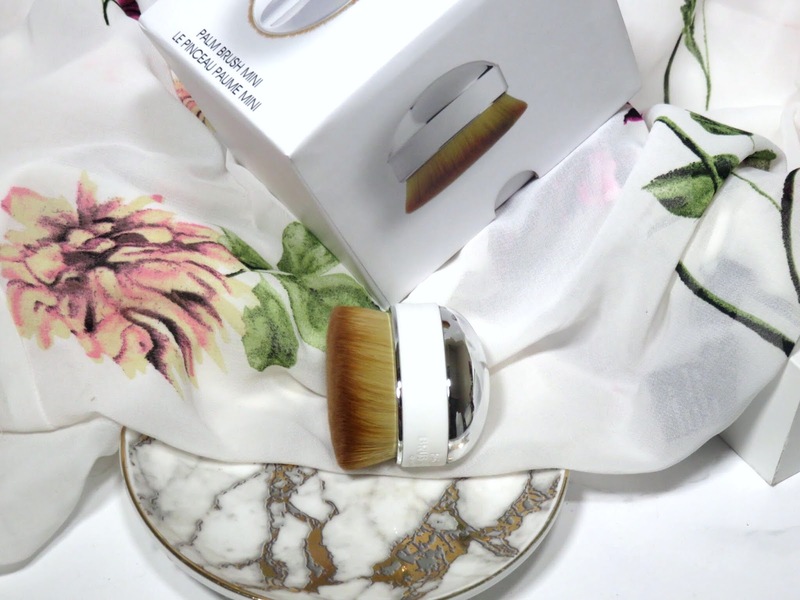 Cream products are the ideal formula to use with this brush because they are often applied directly to the face with a stick and in a thin layer as well. Also, because the texture is thicker, it makes it very easy to blend with the dense brush. You essentially only have to blend the edges of the product and you don't have to use the brush to actually apply the product to the skin. This brush works very well for applying powder and mineral foundations because it so dense. 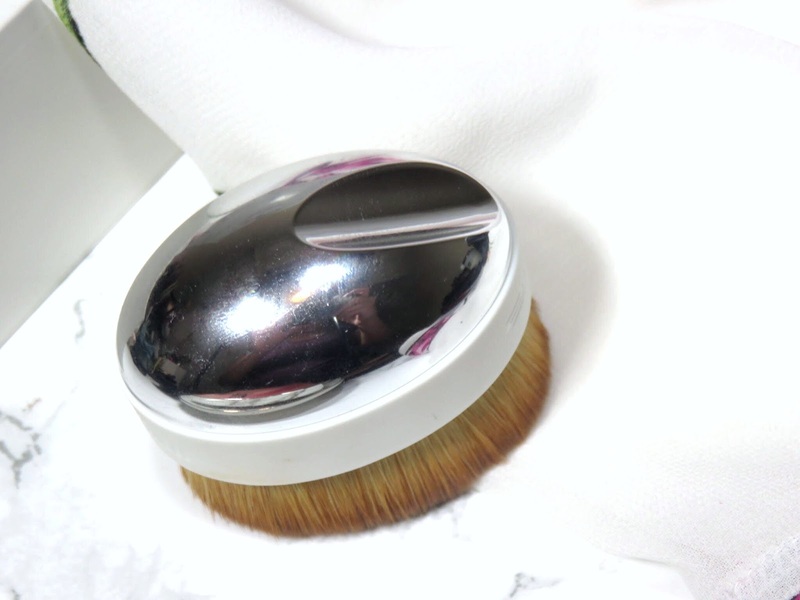 It is like a kubuki brush but it will provide more coverage because of the density. Dense brushes are ideal for buffing powder into the skin and working the product into the skin, making it look flawless and natural. The biggest concern most people have with these brushes is how to clean them. Since the hairs are synthetic, it is much easier to clean than you would expect. I would recommend after each use to spot clean the brush with either brush cleaner or just pure high percentage alcohol to disinfect and clean the brush. Because the brush is so dense, product is not seeping in very deeply into the brush, so thing makes cleaning the brush quite easy. I like using 90% pure rubbing alcohol because it very easily cleans and disinfects the brush after each use but it doesn't damage your brush because the hairs are synthetic. I pour a bit on a paper towel and I run my brush over the towel until it's clean. To deep clean, you can clean this as you normally would with soap and water. Just be aware because it is so dense, it will take a lot of time to dry, about 2-3 days depending on how warm your home is.